let’s get those oft-overlooked spots spiffed up in an instant. Restroom, lavatory, privy, el baño…whatever you call it, the bathroom is one of the last places we like to clean. But what’s better than freshening up in a fresh space? Find out what you may be missing when cleaning the loo and how to get your washroom spotless. Let’s start with one of the least fun cleaning jobs possible. The bathroom drain. Yes, what you find down there may be scary. Yes, it may even shock you. But we promise you’ll be glad once it’s done. Remove the drain plug and pull out any hair balls with needle nose pliers. Flush with hot water. Replace drain plug and don’t look back. This should be done every few months, or sooner if you notice a slow drain or foul odor. We are all suckers for free standing vanities with the pretty legs, no? The great thing about them? It’s easy to remove stray bobby pins, toothpaste tube caps, and dust bunnies that have rolled underneath. Be sure to get under the vanity when cleaning the bathroom floor. Smudges and splatters on the vanity mirror are plainly visible, and get a regular shining. Don’t forget to do the same for the inside of your medicine cabinet. Wipe fingerprints, makeup spills, and toothpaste leaks with a damp, soapy cloth. Anything out of sight is sure to get less attention. 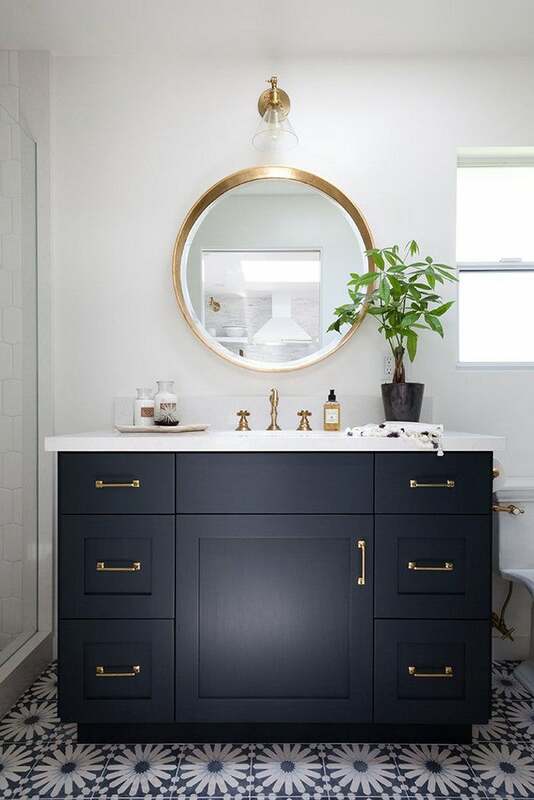 That pretty light fixture you bought to go above the vanity mirror? Make sure you are reaching the top to banish cobwebs and dust. Wiping the vanity counter happens multiple times daily. The sides, not so much. Use an all purpose cleaner to keep the sides and front of your vanity grime free, too. You’ve surely been rewarded with the surprise inside a toothbrush holder in need of cleaning, right? Don’t wait for that disgusting sludge to appear. Pop that puppy in the dishwasher weekly to keep it clean and sanitized, inside and out. Bathroom cabinet handles get sticky, greasy, and dirty. To avoid germs and general ickiness, wipe them off with an all purpose cleaner weekly. Fan growing fuzz? A decent swiffering should keep this important bathroom feature lint free. Take the fan cover down when washing any ceiling mount light fixtures for a thorough cleaning. Your fan will work better and no creepy dust overgrowth. The shower is there to get you clean. Don’t neglect it by leaving a dirty shower curtain hanging. Throw thicker curtains in the washing machine for a refresher and change out liners regularly. Probably goes without saying, but if you have guys in your house (or even if you don’t) go the extra few inches and swab the deck behind your toilet. No need to discuss any further. Those pretty hand towels that mom gave you look great hanging in your powder room. Not so much after they’ve grown a layer of grey fuzz. Nip that in the bud by laundering these guys on the regular. This spot may not be hidden, but the germs and bacteria that linger there are invisible. Be sure to give the flusher a spray and wipe with cleaner when disinfecting the toilet. Another of those handy little helpers we take for granted. Who even knows what lands in a bathroom waste bin. Giving it a good cleansing, inside and out, is muy importante.